Congratulations on your fantastic online resource – Te Ara: The Encyclopaedia of New Zealand – it is interesting, interactive and informative. It certainly is a comprehensive guide to New Zealand’s natural environment, history, culture, economy, institutions and society. Let me introduce myself. My name is Winston Cowie, author of Conquistador Puzzle Trail, which comprehensively and objectively assesses early Spanish and Portuguese voyages to New Zealand and Australia pre Tasman and Janzsoon. Conquistador Puzzle Trail also presents details of New Zealand’s ‘oldest’ shipwreck, a likely Dutch vessel. My purpose in writing to you is to provide an alternative to your current summary of the European discovery of New Zealand. My view, which has been supported and praised by both the Portuguese and Spanish embassies to New Zealand and Australia, is that the Portuguese, most likely and on the balance of probabilities, discovered New Zealand and Australia between 1520 and 1524. The Spanish may have also voyaged to New Zealand before Abel Tasman between 1576-1578. Below, I include your current summary, my comments on aspects of it based on the research in Conquistador Puzzle Trail, and my proposed alternative. Simply put, I think New Zealand and Australia’s discovery theory needs revision. Portuguese and Spanish ships began crossing the Pacific Ocean in the 1500s, but it was probably not until 1642 that a European sighted New Zealand. In that year the Dutch explorer Abel Tasman sailed in search of a vast southern continent, which many Europeans thought might exist in the South Pacific. Dutch merchants hoped this land would offer new opportunities for trade. Tasman discovered New Zealand on 13 December 1642, but after a bloody encounter with Māori in Golden Bay, he left without going ashore. I provide some comment on the above. 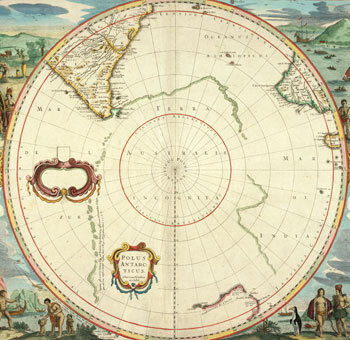 The map that is currently on your website, Henricus Hondius’ 1637 map, is not the earliest of the Terra Australis Incognita or of Australia and New Zealand. I provide you an alternative below based on the 228 year old, well researched theory, that the Portuguese discovered Australia and New Zealand, a theory that has been taken seriously and believed by some of the top cartographers and historians of their time, from Alexander Dalrymple (1786); the British Admiralty (1803); Richard Henry Major (1859), George Collingridge (1895), José Toribio Medina (1918), Robert Langdon (1975 and 1988), Kenneth McIntyre (1977 and 1982), Dr Helen Wallis (1981), Roger Hervé (1983), and Peter Trickett (2007). The maps I provide below speak for themselves for readers of the encyclopaedia to assess. They date to between 1542 and 1566 (over 100 years before Tasman); and the most detailed map (from 1547) includes over 120 Portuguese place names which are descriptive of physical features, features which are in those places today (as an example, at Fraser Island in Australia where there are pumice deposits, the word pomezita is written; similarly where the word camronron appears, which means prawns, there is a modern day prawn fishery today). The coastline of the continent is also similar to that of Australia and New Zealand in most places. On the basis of these maps of the sixteenth century Dieppe school of cartographers, and a number of other artefacts within Australia and New Zealand, the serious and very tenable theory can be made, that the Portuguese discovered Australia and New Zealand. My alternative proposal, for your kind assessment, for your European discovery section is provided below. New Zealand’s current discovery paradigm is that New Zealand was discovered by the Dutch explorer Abel Tasman, who searched for and found the ‘terra australis incognita’ (the unknown southern land), the country later being mapped by James Cook, the British captain, from 1769. A growing body of evidence, however, based on a group of sixteenth century maps known as the Dieppe maps, points to the Portuguese probably discovery New Zealand between 1520-24. The 120 Portuguese names on the landmass which is located in the place of modern day Australia and New Zealand, the similarity of those places to places in modern day Australia and New Zealand, the descriptions on those place names corresponding with the physical features that exist today; and the credibility of the cartographers makes this theory probable. 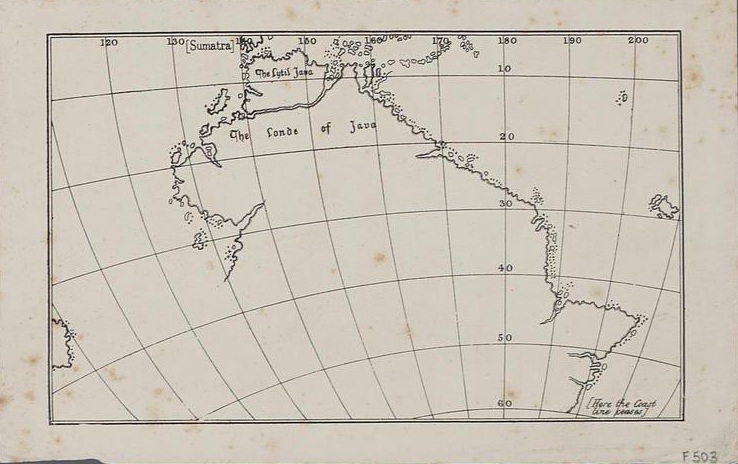 Vallard Map 1547 – the eastern coast of Australia? Map citations: Map 1. A reproduction of Desliens Chart (1566),Dieppe,France. Source: Desliens, Nicholas, Desliens planisphere II (1566), Dieppe, France. Source: Original map is currently located at Bibliotheque Nationale de Paris. Map 2. Rotz, Jean, Circular chart 1542. Source: A reproduction of themap is currently located within Wallis, H. The Maps and text of the Boke of Idrography presented by Jean Rotz to Henry VIII. 1981.Oxford,United Kingdom, located at the British Library. Maps 3 and 4. The Vallard Atlas, 1547, Dieppe, France. Source: The original Vallard map is held by the Huntington Library, San Marino, California and can be viewed at http:// sunsite3.berkeley.edu/hehweb/HM29.html. The sixteenth century was the time of the great Portuguese and Spanish voyages of discovery. In 1494 in what is known as the Treaty of Tordesillas, Pope Alexander VI drew a line of demarcation down the middle of the Atlantic Ocean and declared that all non-Christian lands to the east (Africa and India) were available for Portuguese exploration and all non-Christian lands to the west were available for Spanish exploration. This included America and what lay beyond, which was the Pacific Ocean. Progress in discovering and conquering new lands was swift for both Iberian neighbours. Using carracks and caravels the trade routes to the fabled Spice Islands of the East Indies (modern day Indonesia) opened. Sailing to the east of the Tordesillas line and following Vasco De Gama’s route to India, the Portuguese conquistador Afonso de Albuquerque captured Ormuz at the head of the Arabian Gulf in 1507, conquered Goa, India in 1510, Malacca, Malaysia in 1511, and through to the Spice Islands in 1512. The Spanish were also busy; in 1513 the conquistador Vasco Núñez de Balboa crossed the Panama Isthmus and became the first European to view the Pacific Ocean from its western shore; and between 1519 and 1522 the Spanish through Ferdinand Magellan and Juan Sebastián Elcano sailed around the world for the first time – the first modern-day nation to do so. 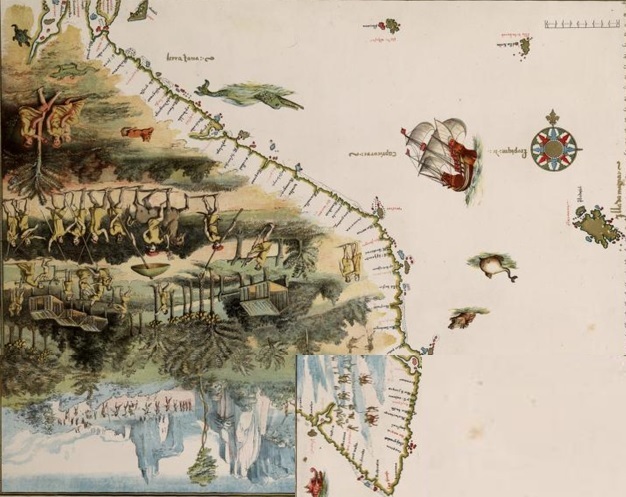 Sixteenth century maps of a great southern continent started appearing from 1542. The most detailed of those maps, the Vallard of 1547 includes over 120 place names on a continent called Jave La Grande or ‘Big Java’ which is in the place of modern day Australia. 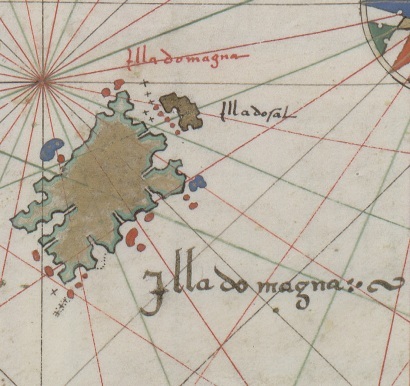 An island, the Illa do magna or ‘Island of Mahogany’ is positioned where modern day New Zealand is located. The voyager that is likely the first discoverer of Australia and New Zealand is the Portuguese nobleman Christavão de Mendonça who between 1520-24 was sent on an expedition to find the ‘Isles of Gold beyond Sumatra,’ of Marco Polo fame. The maps, coupled with artefacts in Australia and New Zealand including the Napier Broome Bay cannon; Fraser Island lead sinker; Tamil Bell; Korotangi and oral tradition of white voyagers visiting Australia and New Zealand prior to Tasman all support the Portuguese theory. The Spanish had bases in the Philippines, Acapulco in Mexico, Peru and Concepcion in Chile in the sixteenth century and believe that Captain Juan Fernandez voyaged to New Zealand between 1576 and 1578 from Concepcion, reached New Zealand at East Cape, accounting for oral tradition in that area of early white voyagers, before spending time in Wellington Harbour. Evidence that supports this discovery include the iron helmet likely found in Wellington Harbour dating to that same period -1560-1580; Maori oral tradition from the Wellington region of a pre-Tasman voyager having a child with a Maori woman; and the Ruamahunga skull – of a European woman living in New Zealand in the sixteenth century dating to within 41 years of that voyage. When these ‘conquistador’ puzzle pieces are put together, it can be theorised that Juan Fernandez may have voyaged to New Zealand prior to Tasman. There is currently no alternative theory to explain what a European woman was doing in the Wellington region in the sixteenth century. In 1642 the Dutch explorer Abel Tasman sailed in search of a vast southern continent, which many Europeans thought might exist in the South Pacific. Dutch merchants hoped this land would offer new opportunities for trade. Tasman sighted New Zealand on 13 December 1642, but after a bloody encounter with Māori in Golden Bay, and after mapping some of New Zealand, he left without going ashore. Shortly afterwards, a Dutch map maker gave the name Nieuw Zeeland to the land Tasman had voyaged to. The debate is open as to whether Cook had an earlier Portuguese chart or charts with him of this area of the world, with Joseph Banks, who was on Cook’s first expedition gifting the map known as the ‘Dauphin Map’ to the British British Museum in 1790, 19 years after Cook’s first voyage of discovery. I would be most grateful for your view and response, Te Ara. What do you think? Is now the time to review New Zealand’s discovery history and have an open mind in respect of earlier Portuguese and Spanish voyages to New Zealand and Australia that probably occurred? Contrary to what it currently states on your website – the Portuguese and Spanish were probably the first Europeans to discover and voyage to New Zealand and Australia. How else can the Portuguese charts and the Ruamahunga skull be explained? Having these probabilities presented on your website would, in my view, encourage debate and discussion about New Zealand’s heritage and culture and be true to and reflective of Australian and New Zealand discovery history. Should you need any further information, may I propose you read Conquistador Puzzle Trail, which is the reference for the above, and is available in Paper Plus stores around New Zealand and all good independents. There are many more puzzle pieces within it that have been assessed to see where they may or may not fit within New Zealand and Australia’s discovery framework. I look forward to hearing from you, and perhaps even seeing a change in the commentary re this important national korero.